The VSR Process improves workpiece fatigue life. Evidence shows that an effective vibration treatment improves a workpiece’s ability to undergo loading and maintain dimensional alignment. The VSR Process maintains the low-labor burden advantages of thermal stress relief while offering improved performance, speed, flexibility, and convenience. The VSR Process makes furnace availability, and workpiece size issues inconsequential. 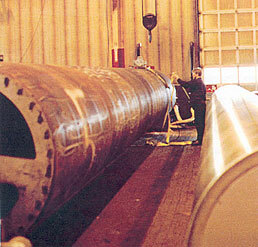 Very large components can be designed, fabricated, stress relieved and machined, without having to be sent to a furnace. Ths VSR Process does not contribute to the extra work needed for workpiece surface preparation, such as the sandblasting required because of furnace treatment. The VSR Process enables design engineers to specify multiple-alloy components since the process makes stress relieving these components as easy and inexpensive as those consisting of only one material. Typically this option is not available using thermal stress relief. Now, using the VSR Process, alloys that respond poorly to thermal stress relief (because they would suffer loss of physical properties, or risk hydrogen embrittlement), or respond marginally (eg, stainless steels), can even be combined. Now, provided suitable welding techniques are utilized, these alloys can now be incorporated into one design. And, as if these advantages weren’t enough, the VSR Process also provides dramatically reduced energy consumption. The majority of thermal stress relief furnaces consume large quantities of natural gas (less than 6% operate electrically). In the United States alone, thermal stress relief consumes enough natural gas each year to heat over 8 million homes. Switching to vibratory stress relief enables not only our customers, but also our customer’s stakeholders – their customers, employees, shareholders, and the people in their community – to benefit from reduced energy waste and pollution. 60' L X 6' Dia, stainless steel, a dual-walled roll for a textile machine.